Shiny and bold slatwall peg hooks for a variety of products! 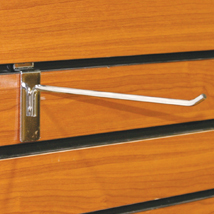 Chrome peg hooks for slatwall are available in a variety of different sizes to fit your slatwall display needs. The peg hook thickness is .228 in. Hang bags and packages neatly to make shopping easier. For many more options, we ask you to take the time to look at our extensive variety of peg hooks for slatwall at Specialty Store Services now.